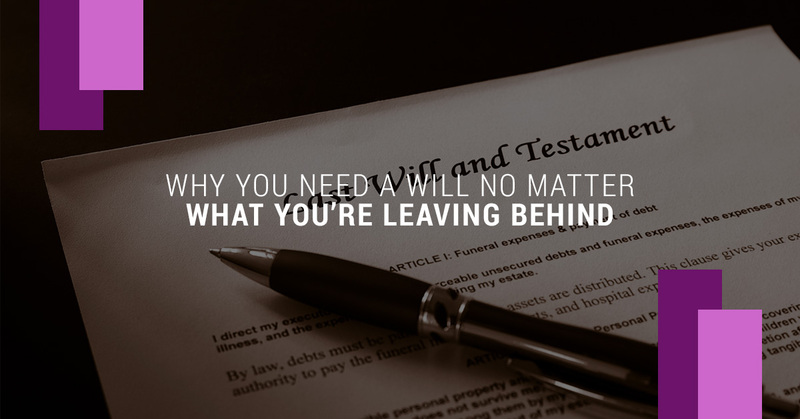 Many people believe that if they aren’t leaving behind any major assets, they don’t need to leave a will. Wills are often portrayed as a means to give away all of your belongings after you die, and yes, they can be used for that purpose. But the truth is, wills aren’t just for the well-off to distribute gifts post-mortem. Wills are put in place to protect both you and your loved ones, even if you don’t have any big assets to leave behind. It’s important to know what a will can do for you and your loved ones before you assume that you won’t need one. Making a will could be more important than you ever realized. It all needs to go somewhere when you die; making a will ensures that it goes where you want it. Names a guardian for your dependents. You might not be leaving behind a massive amount of wealth, but if you are leaving behind any minor children then a will allows you to appoint a legal guardian for them. It’s not just your children, either. A will can help you ensure that any dependents that you care for are properly looked after when you pass away. This includes any disabled family members you care for, senior members of your family in your care, and even your pets. Being able to name a guardian for them can help eliminate confusion after you pass away and ensure your loved ones get the care they need when you are gone. Helps to prevent any arguments within your family. You might assume that your family will follow through with your final wishes after you pass away without the need for a will. But losing a loved one is a very emotionally fraught time and it can lead family members to do things you’d never expect. Having a will in place gives them a clear plan, lays out your wishes, and provides a legal guideline for what needs to happen. That can prevent a fight over even the smallest asset you might have, such as your clothes, a special collection, or even your vehicle. Cuts people in (and out of) your estate. Families are complicated. There are often second or even third marriages, children, step-children, and unmarried partners. If you want to make sure that someone does (or doesn’t) get their share of your estate, then you’ll need to put it down in your will. There is a good chance that your estate will be worth something, even if it’s a couple hundred dollars. Making it clear how that money should be split among your heirs will prevent hurt feelings or anyone being cut out when you wouldn’t want them to be. Gives you control over what happens after you die. Do you want to be buried? Or would you rather be cremated? Do you want to ensure that a specific religious ceremony is followed at your funeral? Whatever you want to happen when you pass away, a will is the right place to put those wishes. Because it’s a legally binding document, those wishes can be enforced. It can be a comfort to know that your final wishes will be honored. If you are married, then your assets will almost certainly revert automatically to your spouse. If you have children from a previous marriage, the law may state that your estate is divided between your current spouse and your children. If you have neither, it will go to your parents or siblings. If they precede you in death, then it will go to the extended family. Of course, there are cases where there are no living family members, and in these cases, your assets will go to the state. It’s only if you specifically name an unrelated party in your will, such as a friend or an organization, that they would receive your estate. It’s not about giving away your stuff. It’s about making sure that your final wishes are honored and you can take care of the people that you leave behind. Creating a will doesn’t have to be expensive or complicated, either. Working with an experienced attorney can make the will writing process as easy as possible and help you ensure that all of your bases are covered. They can help you identify assets that you hadn’t considered or create a plan that includes all of the important people, charities, or organizations in your life. Everyone needs a will, and Capital City Law Office would love to help you create the one that’s right for your situation. Get in touch with us today to make an appointment to make your will. You can give us a call at 208-350-7320 or use the form on our website to contact us. We’ll set up an appointment at a time that works for you.